Your ideas can make the world a better place. A programme for social impact startups and nonprofits to learn how to design, build and test new digital services, working with developers in London and Palestine, and supported by Intersticia. The only thing it will cost is your time. Start by defining your challenge, describing your users, and identifying their needs. Finish up by preparing a user survey, which you will conduct over the following week. Recap the results of the user survey and redefine the problem, identify a specific user journey that addresses that problem, and begin the design process with some paper prototyping. Explore your role as a product owner and familiarise yourself with project management tools and the application development process. End by creating a series of user stories which can form the basis of your app. At this point, we are ready to schedule product development! A team of 2-4 developers will work with you to build a mobile web app that can be tested with users and form the basis of applications for further funding. You will gain experience working with a software development team and see your ideas take shape in digital form. By the end of the process you will have a working mobile web app that you can test with users. What is the total time commitment required of me? After the initial workshops, around 20 hours over the one-month product development period, testing the app, giving feedback and meeting with the developers. What if I want to continue development after the programme ends? The Tech for Better programme is primarily designed to develop your expertise in managing digital projects, to test out new ideas, and to build a case for approaching funders like Comic Relief, Social Tech Trust and Big Lottery Fund, but the apps we build are fully documented and open source. If you already have funding, we have a large community of freelance developers in both London and Palestine who can help. Why are you running this programme? This programme provides an opportunity for our developers in both London and Palestine to gain experience, improve their employability, and work on projects that make a real difference to people’s lives. A web app is a website that looks and feels like a mobile app. This means that users won’t have to download anything from an app store. Web apps can be accessed by anyone using a web browser on a computer, tablet, or smartphone. What sorts of apps do you build? Three examples of previous projects are linked to below. is a web app that helps young people manage their anxiety, built with input from young people and the clinical team at the Anna Freud Centre. Check it out! is a service that provides practical support for people struggling with funeral costs. During the CAST Digital Fellowship, our developers built a funeral costs calculator which was shortlisted for the 2018 Comic Relief Tech for Good awards. 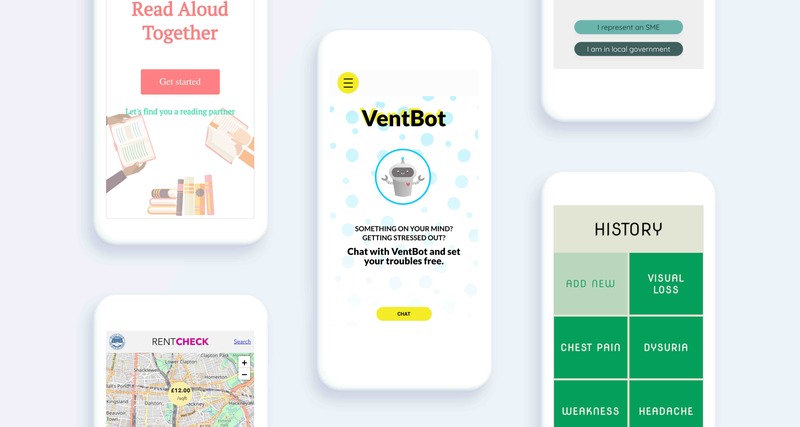 is a chatbot to help women who are victims of domestic abuse find information on the Chayn website relevant to their needs, funded by Filament Consultancy Group. Read about both the client’s and the developers’ experience of the project. What is Founders and Coders and what do you do? Founders and Coders CIC is a UK-based nonprofit that develops and runs tuition-free training programmes in web development, guided by our core values of cooperation, inclusion and social impact. In 2017, we partnered with MercyCorps to establish a campus in Gaza, where youth unemployment is among the highest in the world. The Tech for Better programme provides a rare opportunity for our developers there to gain experience working on real projects with overseas clients.